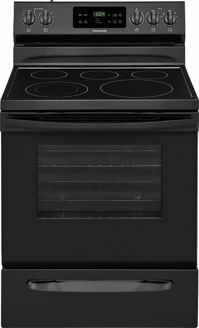 The 30" Freestanding Electric Range from Frigidaire will be the best addition to your place. The unit features a spacious 5.3 cu. ft. capacity oven for any sized dishes. Cook multiple dishes at once with the 5 heating elements. Keep Warm Zone Keep food warm until everything — and everyone — is ready. Store-More™ Storage Drawer With the Store-More™ Storage Drawer, you will have extra space to store your cookware. Built with American Pride Designed, engineered and assembled in the U.S.A.